The real long-term competitiveness of companies is ensured by market share and acceptable profit levels to ensure business continuity and steady development. the continuous pressure to reduce unit costs. All in all, often for many companies, the level of profit generated by sales does not meet the annual and especially multiannual target profit level, and there is a need to look for continuous solutions for cost improvement. In many cases, top management of companies has real concerns about the continuous monitoring of the market evolution for their products and services (clients, suppliers and competitors), but the real concerns for measuring, assuming and continuously improving non-productivity at each process of each family product are still a challenge. Moreover, companies sometimes seek to benefit from external productivity (acquisition of new equipment/ technologies) and less from internal productivity gained through real and continuous reduction of losses and waste from processes. In order to ensure a reasonable level of long-term competitiveness, it is necessary to define and meet the level of external profit (from sales) and internal profit (from cost improvement) through maximizing outputs and through minimizing inputs. It requires the development of contextual productivity scenarios and strategies for each product family cost (PFC) to consistently transform the current business method. internal manufacturing profit through minimizing inputs (I) – the predominant need for productivity increase through improving efficiency (waste reduction – excess amount of input). PBM starts from the development of the multiannual productivity vision and mission, and then sets related productivity core business goals (PCBG) and productivity strategies (PS). Based on PS, productivity policy deployment (PPD) is created, monitoring the implementation of the PS to achieve the overall management indicators (OMIs) and Key Performance Indicators (KPIs) and Cost of Losses and Waste (CLW) associated with the IMO with kaizen and kaikaku indicators (KKIs) and daily management indicators (DMIs). In order to achieve the annual and multiannual KPIs targets, through the support provided by KKIs and DMIs, an annual productivity master plan is developed and updated continuously to ensure the convergence and consistency of all productivity support activities in order to achieve productivity vision. establishing the goals of short- and medium- and long-term productivity of the processes and calculating the actual necessary effects (profit required for each PFC and per total company). PBM construction starts from the company’s vision on profitability (operating profit and profit margin: net profits/ sales) and competitiveness or market share (sales volume) for the next 5-10 years or from productivity vision. Meeting company’s productivity vision (CPV) is the main task of the Board of Directors to satisfy shareholders and to ensure acceptable existence and development of the company, it is reviewed at 3 months and three major concerns are addressed: (1) the main external and internal directions of achieving the multiannual profit; (2) manufacturing target capacity to ensure multiannual target sales volumes for each market/family of products in line with the quantitative competitiveness vision; and (3) multiannual targets profit. The central quarterly question for the board of directors is: Where to go to make profits? To answer that question, targets are developed for the two key strategic indicators i.e. operating profit and the sales volume by developing targets for: growth rates, company value, customer satisfaction, employee moral reputation further in the market, etc. Based on CPV are defined awareness and observance of the perennial values of productivity on: (1) respect for the environment (green company) and (2) respect for human beings and their happiness and creativity (carries responsibility and people’s morale, full understanding of current tasks and relieving these tasks through continuous improvements). Therefore, the CPV aims both at establishing and assuming on a long-term basis (5-10 years) the volumes of sales of products and services and implicitly the external production profit through maximizing outputs (E) and the level of cost improvement and implicitly preponderant internal production profit through minimizing inputs (I). Further on, the PBM construction continues with the second step: developing productivity mission. Based on productivity vision respectively from the sales volume and the need for manufacturing cost improvement, the company’s mission becomes a mission of productivity which focuses on ensuring production capacities to support a quality production and with acceptable costs (both in terms of price and in terms of multiannual target profit). In this context, senior managers develop ways to ensure the production capacities to support the volume of quality sale for the next 5-10 years and directions of cost improvement for each product (if possible) for each product family cost (PFC) in part for the whole company. Meeting company’s productivity mission (CPM) for 3-5 years associated with the CPV; is the top management task that is reviewed at 2-month intervals seeking to achieve target capacity and annual targets profit by continuously developing and monitoring profitability improvement projects (kaizen and kaikaku) through productivity improvement. The central question of senior managers is: What is required to perform capacities vision? The answers to this question are reviewed at least once every two months, depending on the dynamics and customer demands and on the internal current capabilities. Undercapacity (planned capacity utilization> practical production capacity): emphasizing the profit scenario mainly from internal manufacturing profit through minimizing inputs (I) – the predominant need for productivity increase through improving efficiency (waste reduction – excess amount of input). The main tangible outcome of the continuous definition and implementation of the productivity vision and mission is to achieve the annual and multiannual profit target by continuously reconciling the internal and external profit margins. In the following episodes, based on the vision and mission of productivity, we will determine: productivity core business goals, productivity strategies, Key Performance Indicators (KPIs) for Cost of Losses and Waste (CLW), Key Performance Indicators (KPIs) for Critical Cost of Losses and Waste (CCLW) and productivity master plan. What elements are needed for business leaders to have a great vision and mission of productivity to support the continuous improvement culture at the shop floor level? Dr. Alin Posteucă is the founder and CEO of Exegens®, a global consulting firm specialized in cost competitiveness improvement and operational excellence. It helps customers create and implement profitable strategies and cost improvement programs that ensure a unit cost improvement of at least 6% per year for each of the next 5 years by maximizing the efficiency and effectiveness of operations. 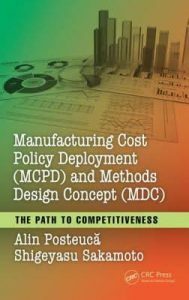 He is the author of Manufacturing Cost Policy Deployment (MCPD) concept, published in three books at Productivity Press – Routledge/ CRC, New York (USA). 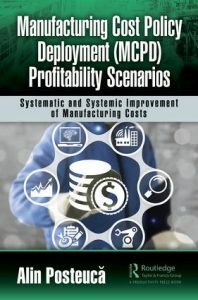 The latest, ”Manufacturing Cost Policy Deployment (MCPD) Profitability Scenarios: Systematic and Systemic Improvement of Manufacturing Costs” (October 2018) is based on its main belief that the annual and multiannual target profit can be achieved irrespective of the sales volumes, increasing or decreasing. 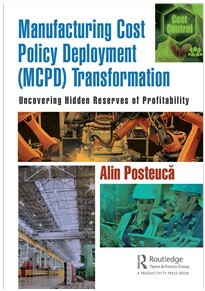 He is also the co-author of the book ”Manufacturing Cost Policy Deployment (MCPD) and Methods Design Concept (MDC): The Path to Competitiveness”, published at Productivity Press New York (USA), 2017, as well as the author of the book ”Manufacturing Cost Policy Deployment (MCPD) Transformation: Uncovering Hidden Reserves of Profitability”, published at Productivity Press din New York (USA), February 2018. Alin Posteucă has more than 20 years of experience in Cost Improvement consulting and training. He has a PhD degree in Industrial Engineering and a PhD degree in Economics.